The Coalition of Immokalee Workers Tour Across the Country with the Florida Modern Day Slavery Museum | Democracy Now! The Modern Day Slavery Museum explores the history and evolution of modern day forced labor in the agriculture industry and the long legacy of slavery in the food that we eat. The Museum is the latest campaign by the Coalition of Immokalee Workers. Housed in a box truck, the museum is on a sixty-stop tour across the country. Democracy Now! caught up with the tour in front of Judson Memorial Church in New York City and was given a tour by Julia Perkins, who has been organizing with the Coalition of Immokalee Workers in Florida for the last ten years. JULIA PERKINS: The centerpiece of the museum is the box truck that you see behind me. It’s a replica of a produce truck that was used in a case that was prosecuted in 2008 in the federal court system. The bosses of workers who were picking tomatoes held them in a truck like this. They were locked in overnight to make sure that they’d be available to pick tomatoes the next day. Those workers had been beaten, chained, physically restrained by tying them to poles, by their bosses. They owed their bosses money for things like rent to sleep on the floors of trucks, money to — $5 every time they wanted to bathe after working for a long day in the fields, which was just washing off with a garden hose in the backyard, for food that the family would provide for them, because they didn’t have any money to buy their own food. So they weren’t paid. They were treated terribly. And that case went through the federal court system in 2007, 2008. But that’s not even the last one. There are currently cases under investigation and the brand new case, that just came to light, with the unsealing of an indictment about two weeks ago, in which Haitian workers had been brought over on H2 agricultural worker visas, and where their documents were seized. The women workers were abused. No one was paid for the work that they were doing. And that’s as recent as a few weeks ago. So these are things that are happening now. This is not history. It’s living history. It’s abuses that are current and happening in the Florida agricultural industry today. The Coalition has also fought back against the sub-poverty wages that have been stagnant since 1978. The bucket you see here, for example, that weighs thirty-two pounds when it’s full of tomatoes, is here for people to try to lift and with thirty-two pounds of rice in it right now. But for every bucket that a worker picks, they receive 40 to 45 cents, the same rate paid in 1978. That means that to make $50 a day, a worker has to pick two tons of tomatoes; to make the equivalent of minimum wage, two-and-a-half tons. The agricultural industry is complex, and it’s built complex for a reason. Workers are working for large producers of tomatoes but are recruited by crew leaders, who serve as the middle men. But in the end, the large buyers of tomatoes are really forcing the wages to remain low by demanding volume, volume of tomatoes at the lowest possible prices. So the only ones who really suffer that are the workers, whose wages remain stagnant because of those conditions. And when we have degraded conditions and sub-poverty wages in an industry, that’s when we see cases of forced labor come to light. We do have a long legacy of forced labor in the agricultural industry. In fact, it’s hard to say that Florida has ever been free from forced laborers since the agricultural industry has existed in Florida, And so it’s this ongoing mentality that workers are less than human beings that really helps to perpetuate the current situation for farm workers, workers who are enslaved and also workers who are free but working under conditions that are like sweatshops in the fields. About 90 percent of the tomatoes that are consumed on the East Coast during the winter months come from Florida-based companies, come from the area of Immokalee. And so, that means that any — most consumers, at one point or another, have encountered tomatoes picked under sweatshop conditions by farm workers. And so, the workers have decided to try to use the volume-purchasing power of large corporations, large buyers of tomatoes, to change the conditions that they face every day in the fields, and, to date, have agreements with eight corporate buyers: McDonald’s, Taco Bell, Taco Bell’s parent company Yum! Brands, Subway, Burger King, Whole Foods Market, Compass Group, Bon Appétit and Aramark, who have all agreed to pay a little bit more for the tomatoes that they buy to make sure that workers are making a little bit more money, that that money gets passed on to workers in their paychecks, and also to work with the Coalition of Immokalee Workers in implementing a code of conduct that protects workers’ basic human rights and gives them a voice in the workplace, and also sets out zero tolerance for conditions of forced labor in any of those buyers’ supply chain. 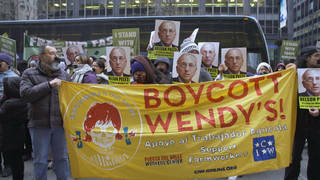 With those eight corporate buyers who are participating in these fair food agreements, there are actually many corporations that still have not come to the table, including some of the major supermarket chains, including Ahold, which owns Stop & Shop, Giants, Martin’s, and are all throughout the Northeast; Kroger in the Midwest and South, Southeast; and also Publix. It’s the main supermarket chain in Florida. And we’ve been asking them and Trader Joe’s, as well as most of the other supermarket chains in the United States, to come on board, to be part of improving conditions for farm workers.